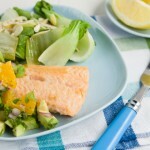 A 15 minute meal complete with a fresh orange and avocado salsa, a fillet of moist salmon and lightly cooked bok choy. Combine salsa ingredients in a small bowl. Stir to coat, cover and place in the fridge until ready to use. Preheat a non-stick pan on medium heat. 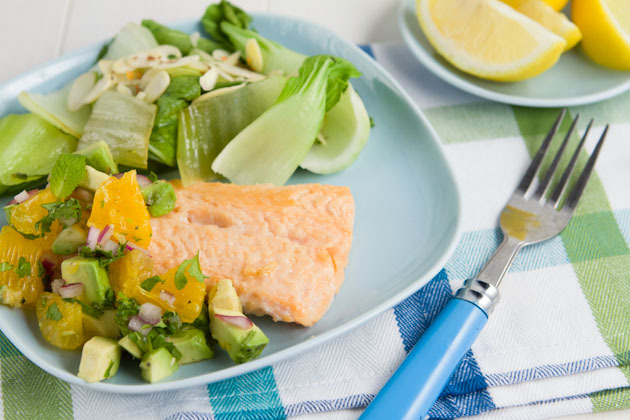 Add salmon, flipping halfway through, until cooked. About 3 to 4 minutes per side. When you have about 1 minute left, add a spritz of lemon juice from your leftover squeezed lemon. Just a touch is all you need! Meanwhile, heat a second pan on medium heat and add bok choy. Cook until bright green and slightly wilted, about 1 minute per side. Transfer to a plate and top with slivered almonds and red pepper flakes. Spoon salsa over fish to serve.